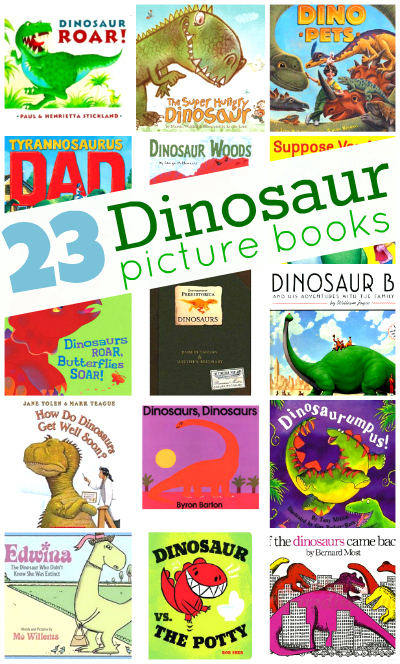 Dinosaurs are always a hit at our house and reading dinosaur picture books with your kids is fun anytime. There are so many great books to choose from, and this list is just the tip of the iceberg. If you have a favorite dinosaur picture book that isn’t included, please leave a comment so other readers can check it out. 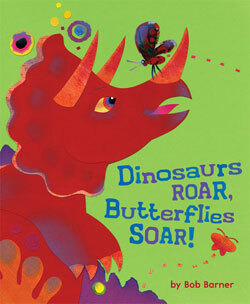 Dinosaurs Roar, Butterflies Soar! by Bob Barner. They say don”™t judge a book by its cover, but this cover was so bright and inviting I popped the book in my bag without so much as reading the title. It turned out fine for me, this easy nonfiction book is a wonderful way to explain to kids how the dinosaurs became extinct but that some even more outwardly fragile species like the butterfly survived. One thing I really appreciate about this book is that on each page there are two sections of text in different fonts. The larger font tells the main simpler explanation while the second paragraph in the smaller font goes into more scientific detail for older or more advanced kids. My son loved it and I would say judging it by its cover was pretty accurate. 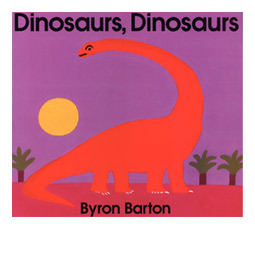 Dinosaurs, Dinosaurs by Byron Barton has always been a favorite of mine for introducing dinosaurs to young kids. It”™s very basic, very bright and has the fundamental facts about dinosaurs without loading toddlers down with too much information to sort through. The illustrations are bright, fun and descriptive on their own and will keep even the most fidgety 3-year-old entertained. 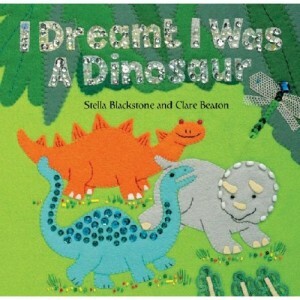 I Dreamt I Was a Dinosaur by Stella Blackstone is such a pretty dinosaur book. This board book appealed to my daughter right away, but I will be honest it was the images, not the text that drew her in. The illustrations are all pictures of bright fabric dinosaurs with beads and sequins, and the sparkle was an immediate hit with my girly girl. The text is short which is perfect for the board book audience and has good rhymes even if the rhythm isn’t as great as other titles by this author. I like that the author manages to slip in some basic facts about different dinosaurs as well. Oh, My Oh My Oh Dinosaurs! 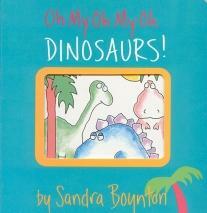 by Sandra Boynton is a cute little book about opposites with dinosaurs as it”™s characters. This is a good book for little people who love dinosaurs but aren”™t really ready to dive into facts about them yet. 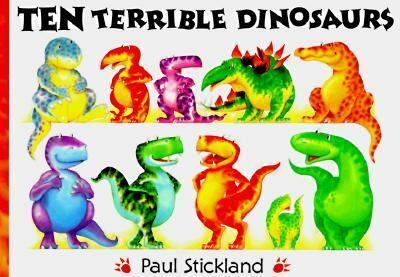 The melodic rhyming text and adorable pictures appeal to younger toddlers, and on the page where the dinosaurs are called bad for painting on their friends made both me and my son laugh. 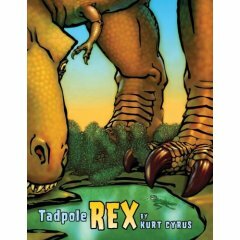 Tadpole Rex by Kurt Cyrus is one of those books that I wonder why I”™ve never read before. It”™s so good! It could be used in a dinosaur unit to talk about how large the dinosaurs were; its illustrations show the size difference between a frog and a dinosaur beautifully from the frogs perspective, it could be used to teach about the Frog life cycle as well. What I loved though was the rhyme and rhythm the book had, it was almost musical and in a book about frogs and dinosaurs that are awesome! Dinosaurs! 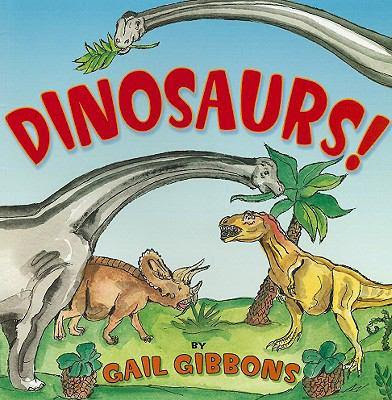 by Gail Gibbons is an interesting and comprehensive introduction to dinosaurs for preschoolers. If you have a little one who wants to know more, this is a great book for them. It covers the basics and then some about dinosaurs and paleontology. 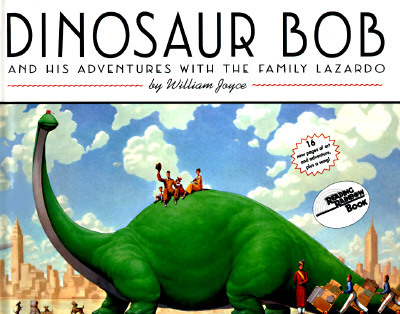 Dinosaur Bob and His Adventures with the Family Lazardo by William Joyce. We were two pages into this book, and my son already declared which character was his favorite. He loved this book. The story follows an adventurous family that goes on Safari where their youngest child catches a dinosaur. The dinosaur is named and accepted into the family. While they travel everything is wonderful but things get harder when they return home, and not everyone in their hometown is as accepting as they are. I loved this book; it’s whimsy and heart for adventure. 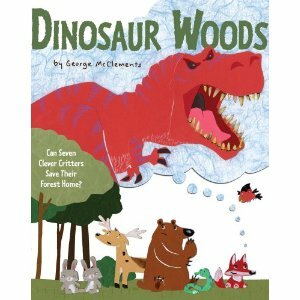 Dinosaur Woods by George McClements was my favorite pick from our latest library trip. I laughed all the way through this book because of its snide remarks and funny asides. I made a huge mistake, though, I told my son how hilarious it was and oversold it to him. The humor went right over his 5-year-old head. Oops! Luckily the story is great on its own. It’s about a bunch of forest friends who are trying to save their home from developers and get a great idea to make a dinosaur since no one would ever take a home away from a dinosaur. It’s really a book about conservation, but it’s funny ( I stand by that) and sweet and a new favorite of mine. Dinosaurumpus! by Tony Mitton is a dream of a book to read to a group of kids. It was the three rs of a wonderful picture book: rhyme, rhythm, and repetition. The author makes dancing dinosaurs into a fantastic musical story. My favorite part of this book is the chorus on each page and kids jump onto it immediately, so expect them to participate and sing along. It should be noted that while toddlers will likely love the book and its great friendly illustrations, it’s not a short book. You may want to edit it for length or read it in parts. 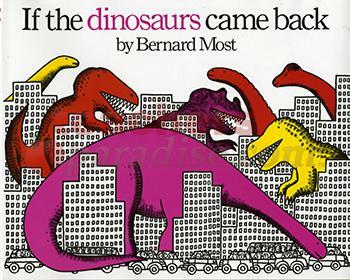 If the Dinosaurs Came Back by Bernard Most is an old favorite of mine. It’s a simple book that imagines how life would be so much easier if dinosaurs came back. They could help build skyscrapers, graze on your lawn, so you don’t have to mow and even help librarians reach the books on the top shelf. Of course, it doesn’t take that old a child to tell you why most of these ideas are silly, but it’s a delightful book that can be read to a wide range of ages and depths of imagination. My favorite line is that if they came back, they would give giraffes someone to look up to. 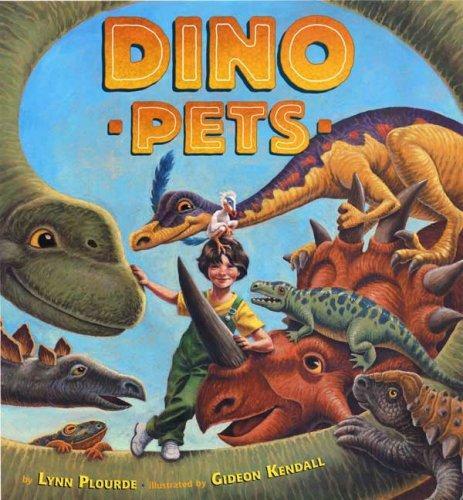 Dino Pets by Lynn Plourde is a simple book about a little boy who keeps buying pet dinosaurs. The wonderful thing about this book though is that he only ever buys exceptional dinosaurs and the reader gets to learn about them all. The fastest, longest, softest, smallest, and even scariest dinosaurs are featured in the story and the nonfiction facts that the end of the book. 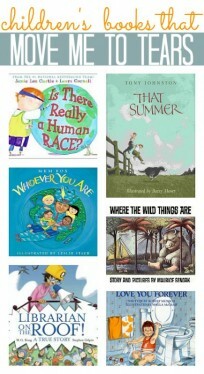 A great bridge between fiction and nonfiction for young kids. 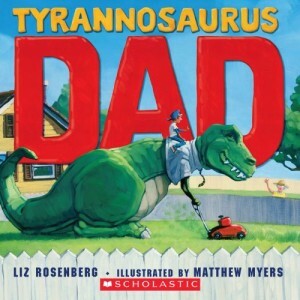 Tyrannosaurus Dad by Liz Rosenberg has great intentions, but I am not sure it delivered. The part I liked was that this story is about a little boy who has a very different dad, who is a dinosaur. I also liked that she never explains why he is a dinosaur, it drives home the fact that families come in countless variations and that the dad’s downfall isn’t so much his size or the fear factor, but instead it’s that he works all the time. Many kids can relate to that. What I didn’t like so much was the actual text, it didn’t flow as easily as I would have liked and instead of a real story, it seems like a synopsis of events. Good heart though. 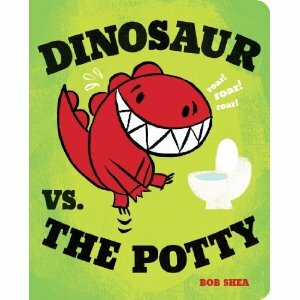 Dinosaur vs. the Potty by Bob Shea is the reason my voice has been hoarse for days. My kid’s love, no ADORE this book. My son who is 5 is in stitches every time we read it, and my daughter who is 2 reaches for it time and time again. The thing about this book is you must read it with gusto for it to reach it’s full potential because its story isn’t deep it’s really just about a destructive dinosaur who doesn’t go pee when he should. Sound familiar? Kinda like little kids who dump toys, bang, and stomp and deny that they have to use the potty until the very last minute. It struck a chord at our house, and I have a hunch it may at yours too. Suppose You Meet a Dinosaur: A First Book of Manners by Judy Sierra is a really great book about manners with one really bad line. Ok so a little girl meets a dinosaur at the store and proceeds to have polite exchanges while she gets in and out of uncomfortable situations. I really like the learn by example aspect of this book and the bright illustrations. When the dinosaur turns down a treat the little girls offers her this is what the book says ” The Dinosaur is worried that the brickle snack will make her fat.” Urgh. I try so hard to try to promote healthy body image and to not demonize food around my kids especially so I edited the line but it may not bother you as much as it did me. 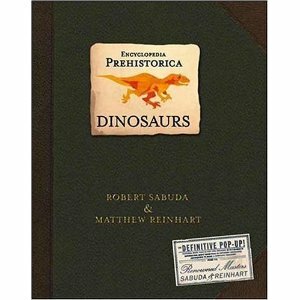 Encyclopedia Prehistorica Dinosaurs: The Definitive Pop-Up by Robert Sabuda is truly awesome. You will gasp, giggle and find yourself amazed at every turn of the page when you read this incredible book. There is a large pop up in each two page spread ( beware some might be scary! ), as well as smaller pop ups on the pages as well. Under neath the intricate art is a ton of facts as well, it can just be a little tricky to get some kids to pay attention to the text with a giant dinosaur coming out of the book. My sister bought this for my son years ago but we waited until last year to give it to him, and at 4.5 he is still awed and distracted by the pop-ups. My guess is as his reading skills get stronger this will be a favorite quiet time book to read and play with. 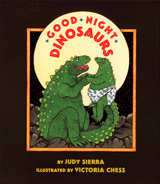 Good Night, Dinosaurs by Judy Sierra is a tongue twister, and I love it! I have a hard time pronouncing dinosaur names, but the cute little rhymes she writes to go with each helps. 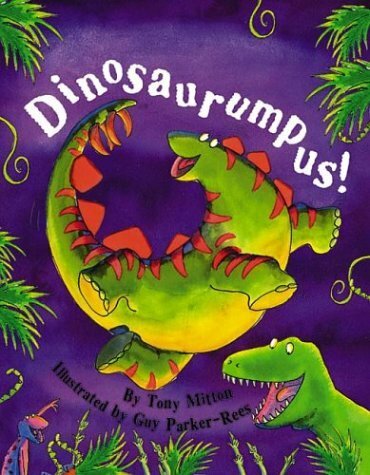 The book is simple, parent dinosaurs tucking in and getting their little dinosaurs ready to fall asleep. 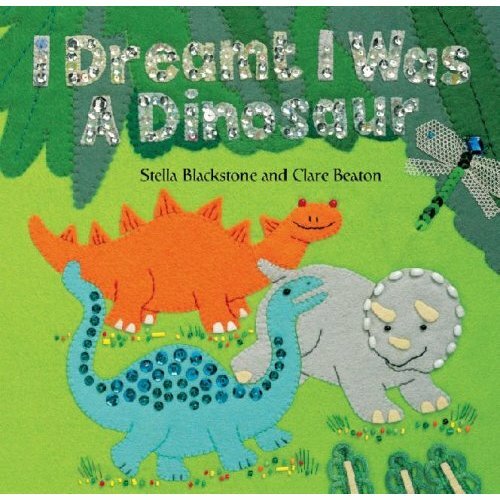 Your child will love the catchy “Good Night Dinosaurs, Sleep Tight Dinosaurs, Good Night Dinosaurs, Goodnight!” I know I did. Dinosaur Roar! 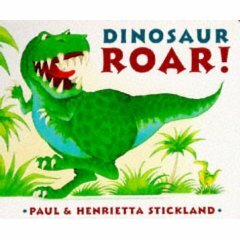 Board Book by Paul and Henrietta Stickland and is a board book that I”™ve read often enough that I don”™t need to look at the book. The premise is simple, using two different dinosaurs every page illustrates a pair of opposites. Toddlers and young preschoolers adore this book, and I can”™t blame them, it”™s adorable and a great tool for teaching! My son loves how funny the illustrations are and clearly enjoys the rigidity of the opposite concepts. Ten Terrible Dinosaurs by Paul Stickland is a great counting book for kids with bright and colorful dinosaurs. Both my kids liked this book, so it appeals to toddlers and preschoolers alike. My favorite part is the surprise ending that always produces giggles! 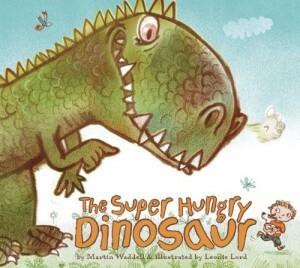 The Super Hungry Dinosaur by Martin Waddell is a nice story about a little boy who saves himself and his family from a hungry and kinda scary dinosaur. First, he talks the dinosaur out of eating him and his family but then when he goes after his dog he captures him. When the dinosaur gives up the fight and begs for food the little boy agrees to feed him if he makes amends. It ends with a huge burp ( a sure-fire hit with kids) and a super full dinosaur. Why I have bothered to include this book was that its story really seems to talk to kids desire to be a hero, to save their family and feel powerful. The bit about natural consequences was a nice bonus too. I Am an Ankylosaurus by Karen Wallace tells the story of an ankylosaurus and how she lays her eggs, protects them with her armor and tail, eats leaves and fights off a tyrannosaurus rex. It”™s not a bad book, and dinosaur lovers will still like it, my son did, but I was sorta left with the question “So what?” I didn”™t care about this dinosaur; there was nothing that made me feel like I should. Like I said my two years old liked it but didn”™t ask to read it again. Dino-Soccer by Lisa Wheeler is a fun play by play look at a serious dinosaur soccer match. 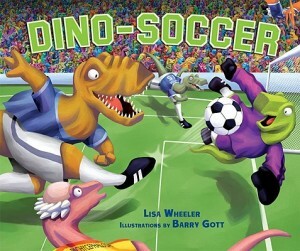 I appreciated how the author wove facts about dinosaurs into the active text about the soccer game. My soccer loving son really liked it and was completely engaged in the neck and neck game that the two teams of dinosaurs facing off. I liked the mini-lessons about sportsmanship and the fast pace the book maintained throughout. 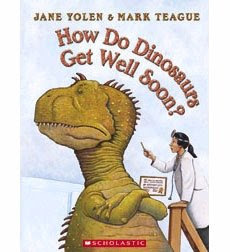 How Do Dinosaurs Get Well Soon? by Jane Yolen is another favorite. I like the whole series in general and think this book is a great one to read before doctor appointments especially if you have a child like mine who is never happy to go! I love the details in Mark Teague”™s illustrations and never tire of reading this book, even when my son grabs it again and again. Just requested a bunch of these from our library, thank you for the roundup! We love love love Jane Yolen’s dinosaur books! How Do Dinosaurs Say Goodnight? is a favorite in our house. I love how she really “gets” the universal kid behaviors, and the rhyming words flow well in most of her books. The illustrations are super. 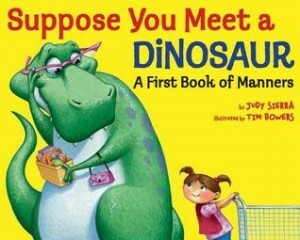 I will have to check out some of these other books–my son is crazy about dinosaurs. I love this book (and so does my son)! We have a couple of these from the library this week too! I am going to have to track down Good Night, Dinosaurs because my 6 year old is very much into tongue twisters right now. Thanks for the tip! I have two girls who aren’t really into dinosaurs but they love anything with Danny the Dinosaur! Especially the birthday book! One more to add to your list: Chalk. It’s wordless, which I’m usually not a fan of, but this one’s delightful. Lots of imagination in this one. My 2nd Graders love them! What a fun list! I would add Thesaurus Rex by Laya Steinberg; Gus, the Dinosaur Bus by Julia Liu; and Bang! Boom! Roar! A Busy Crew of Dinosaurs by Nate Evans and Stephanie Gwyn Brown. I love this craft! I pinned it to my board along with other crafts and lessons relating to dinosaurs that I’ve linked to my book, THE DINOSAUR IN MY BACKYARD? No “Patrick’s Dinosaurs”? That was my favorite book as a child! It might be better for older preschoolers (4- to 5-year-olds) but it’s still a fantastic book. I work at a children’s book store and I’m sad to hear a lot of parents aren’t familiar with it. Please check it out–I’m sure your son will love it! What a great list! 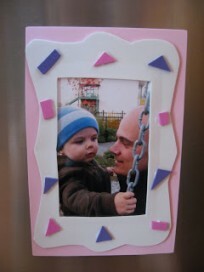 I’ve pinned it onto my Dinosaur board. I love writing about dinosaurs. I think I like them as much as kids do. 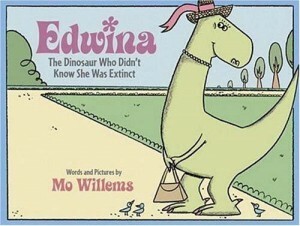 My very first book THE DINOSAUR WHO LIVED IN MY BACKYARD is still in print after 25 years.